The second PlayNow Poker Champion of this six-event series has been found. 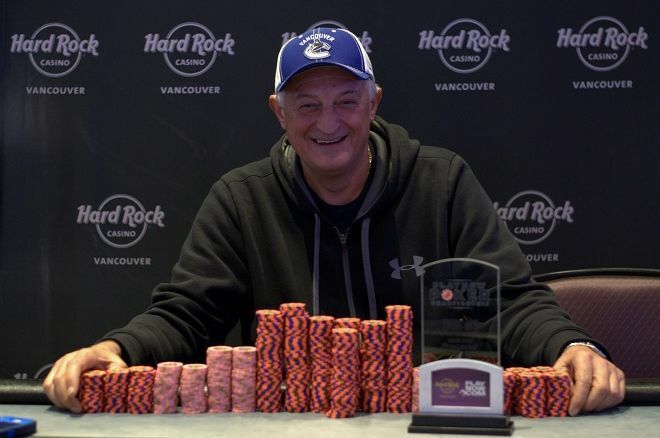 Late in the evening on Sunday night, Mijat Djakovic claimed victory in the $800 freezeout at Hard Rock Casino Vancouver. With 197 total entries across the two starting flights, 55 of them came back on Sunday at 11 a.m. to play for a piece of the $141,052 that was promised to the top 20 finishers. By early afternoon, the money bubble was burst, and it was Fatima Nanji — the last lady standing — who had the unfortunate position of being the last player eliminated outside of the money. Online tournament poker wizard David Quang began the day with an enormous chip lead, and he maintained his position as the frontrunner into the money. Then he doubled up several of the small stacks who were looking to get it in once they were in the money. Reduced to a stack that was closer to average, he then lost a pot with ace-king to pocket queens, and then was eliminated with nine-jack suited to king-queen. He earned $2,821 for 11th place. Keith Wintermans was the second-best stack at the start of the day, and the only other player to have bagged more than 200,000 chips on Day 1. He carried his stack much further, eventually being part of the three-way chop that saw him awarded second place. Chris Jonat also enjoyed a spell as the chip leader for a good portion of the final table. He was the first player to surpass a million chips, but a little while later he three-bet shoved preflop with pocket threes and wasn’t all that thrilled when Mijat Djakovic called him. Djakovic had king-ten suited and, while Jonat hit a set on the flop, Djakovic had a straight by the river, and Jonat was eliminated in fourth place for $9,521. That pot put Djakovic well ahead of his final two opponents. The final three players exchanged chips for a few hands before going on their scheduled break. When they came back, Keith Wintermans and Kurt Hashler were neck-and-neck right at about 1 million chips while Mijat Djakovic had 1.9 million. Before another hand was dealt, they decided to chop up the remaining prize pool. Hashler and Wintermans each received $24,389 and Djakovic took home a little more because of his chip lead — $27,390. This is the first recorded tournament cash for Mijat Djakovic, as well as for Kurt Hashler. Keith Wintermans has been in this spot before. He final-tabled the West Coast Poker Championship last year and won the Coast to Coast Poker Championship in 2008, among other accomplishments. Amazingly, for Kurt Hashler, this was his first-ever live tournament. He won his seat after initially winning a $3.50 step satellite on PlayNow.com and parlaying that into the $800 PlayNow Poker Championship seat. He sat down in a live tournament for the first time in his life after investing only $3.50 and eventually made a three-way deal that saw him walk away with $24,389. The day also began with three WSOP bracelet-winners including a November Niner among the final 55, proving how tough Vancouver poker can be. However, Ashkan Razavi and Robert Cheung were unable to make it to the money. Of the three, only Matt Jarvis snuck past the bubble, only to collect a min-cash of $2,116 for 17th place. For more details on the tournament, head to our live reporting page for the event where you can read back on the big hands, track the progress of chip counts, and browse the photo gallery. The PlayNow Poker Championship steams forward with the third event on Monday. At 11 a.m., the $330 bounty tournament will begin and play all the way through to a winner before the day is done. PokerNews Canada will be on the tournament floor once again, and you can follow our live coverage of the action on our live reporting page for photos, chip counts, big hands, and all of the excitement of premier Vancouver poker.